A feline feral, Nadia Fortune is the last surviving member of the Fishbone Gang, a notorious band of otherwise Dagonian thieves. Their last mission ended in tragedy: a failed attempt to steal the mysterious Life Gem from Lorenzo Medici resulted in their grisly deaths. Before meeting her own doom, Ms. Fortune swallowed the Life Gem and managed to digest it. The Gem’s power permeated her entire body, making it truly undying… even after being cut into several pieces. Now hiding in the shadows of Little Innsmouth, Ms. Fortune plots to avenge her fallen comrades. 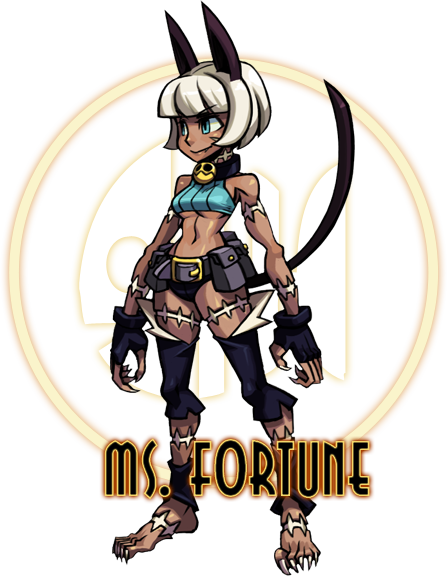 While the first three girls all have videos up, Parasoul (announced at Evo) and this new character, Ms. Fortune, do not, so stay tuned to see those go up.